This was taken up near La Connor, Washington, during the Skagit Valley Tulip Festival. There’s a bunch of tulip farms up there, so every April, there’s a ton of tulip fields to go check out. It’s kind of a trip, seeing whole fields of these really bright, bold colors. Each time you go, there are different varieties blooming, and thus totally different colors. 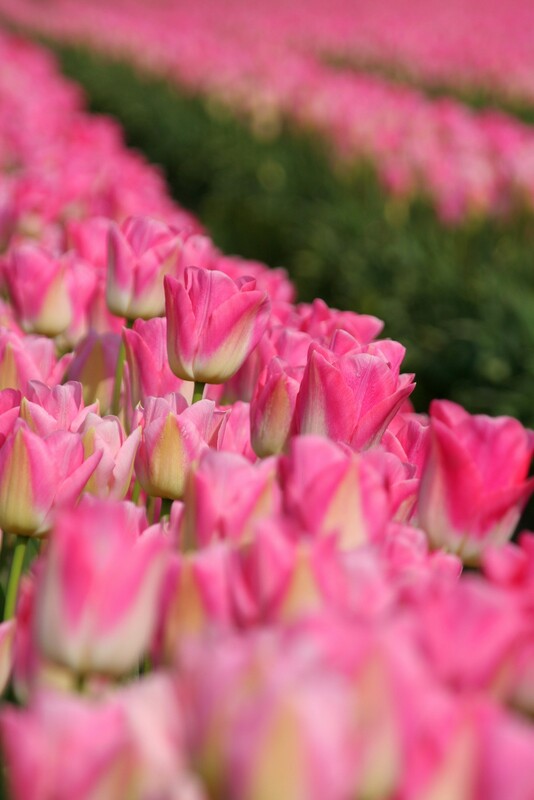 This time around, we ended up in a tulip field with these pinks, some deep reds, and some purples. Since it’s the Seattle area in April, the weather of course can be hit or miss, but if you hit it on a nice day, it can be a lot of fun. Because of the holiday weekend, this is going to be the last post until Tuesday. I haven’t decided for sure yet what my general policy will be on weekends. I’m leaning towards only putting up pics on weekdays, but if you have an opinion either way, let me know. Or don’t. Whatever. Notes: Canon EOS Rebel XT, Tamron 28-300 mm VC lens. 1/400s, f/8.0, ISO 100. Focal length: 200mm.